Nearly a month after she arm-twisted the Centre into partially rolling back rail fares, West Bengal Chief Minister Mamata Banerjee today issued a 15-day ultimatum to the UPA government on her repeated demand for a three-year moratorium on the huge interest burden of the state. Livid over the U-turn made by Additional Solicitor General Harin Raval in the Italian ship case, Kerala Chief Minister Oommen Chandy today sought his immediate withdrawal from the case even as Centre distanced itself from the ASG's remarks. In an audacious daylight operation, Maoist rebels today abducted the Collector of Chhattisgarh's Sukma district from the middle of a meeting with villagers after killing his two security officers. It�s been a year since Gurkirat Sekhon aka Gikki was shot dead in cold blood in Jalandhar, yet cyberspace continues to be abuzz with people from across the world expressing solidarity with the young Jalandhar hotelier and seeking justice for the victim of a callous wrong. 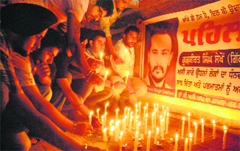 A candlelight tribute to Gikki in Jalandhar on Saturday. Pakistan on Saturday set up a judicial commission to probe the crash of a private passenger plane that killed 127 persons and took the owner of the airline into "protective" custody. Ace lawyer Abhishek Singhvi may have stonewalled media houses� efforts to publish or broadcast a controversial CD involving him. But he has found himself defenceless before the social media networks, which are now abuzz with the objectionable CD. Worried over the spurt in cross border transactions and tax evasion, India has pressed for automatic exchange of information among the countries to deal with the menace.